Today’s blog will possibly irritate other theatre makers to want to either comment on it or just tut and sigh, or roll their eyes – the international language for ‘Oh he just doesn’t get it’. The ‘it’ I don’t get is the latest trend in theatre making – I call it a trend because I see it as that – a passing fashion. Simon Brewis (a Red Ladder associate), recommended a really brilliant little book to me called ‘Steal Like An Artist’ by Austin Kleon. It is so good I gave it to the undergraduates at Northern School of Contemporary Dance to pass round – and of course, because it is so good, I didn’t get it back! The central message of the book is that ‘good’ art results from stealing from each other – steal great ideas and make them your own. This piece of advice came as a huge relief to me – every single piece of theatre I have made for the last three decades has stolen nuggets glistening in it but they take on a slightly different glister when stolen not copied. Here’s an example of stealing. I saw a production at the Edinburgh Fringe called ‘Dublin By Lamplight’ by The Corn Exchange an Irish company, and they used bouffon white face in a really interesting way. My next production was Brecht’s ‘A Respectable Wedding’ and I immediately thought that the slightly surreal, grotesque nature of the piece suited exactly the same extended characterisation – and it really worked brilliantly. I got so hooked onto this that I later used it in a Red Ladder production, ‘Forgotten Things’ by Emma Adams. 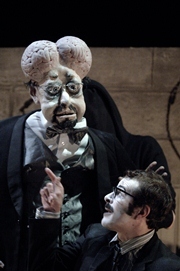 Sara Perks designed an absolutely beautiful ‘grey scale’ set for Emma’s surreal and grotesque play – the only colour onstage was the lipstick on Margo’s mouth and this stood out like a nasty wound in her face. I stole the visual choice of the face make-up but I used it for specific effect in both productions and anyone from The Corn Exchange could not have accused me of plagiarism – it was a great stylistic idea and it augmented my work. The problem really comes when an idea like this becomes a trend. Imagine walking into a nightclub wearing an outfit of new clothes. You feel great – you feel cool, you know that tonight people are going to look at you and envy your style. You walk through the doors into the main bar and there, in front of you and oblivious of their massive faux pas, are several people wearing exactly the same outfit – exactly . How do you feel? Do you feel relief – that you fit in and clearly several people share your impeccable taste and it is clearly ‘in’? Or do you rush out and feel sick with the utter shame of losing your individuality? It’s a silly scenario I know. But I was excited when we took ‘Forgotten Things’ to Edinburgh in 2009. I was proud of the style of the piece. Not only was there a superb design but John Barber had made us a quite spectacular ‘humanette’ – which is a puppet that is worn on the front of the puppeteer’s body and the wearer’s legs become the puppet’s legs. This particular puppet was operated by the very talented Jack Murray – who also so happens to be very tall – so our humanette was close to 8 feet tall. The only problem was – without me even tuning into this – when we got to Edinburgh there was a glut of shows with performers in white face grotesque make-up and an even bigger glut of companies using puppets – admittedly they were all using small manipulated puppets no-one was using a humanette – but suddenly I felt deflated, I felt that our work was just following the latest trend. My ‘stolen’ feature was no longer augmenting my work it was apparently just an example of ‘copying’. I had fallen into a trap that I had tried so hard to avoid. So what is the latest trend that I feel theatre is smothering under? Well there are one or two very, very interesting makers that I really respect – but I have no interest in stealing from them so maybe that is my problem – I don’t feel there is anything in their work that I love enough to steal! The two I’m referring to are Tim Crouch and Chris Goode. Their work really pushes us to examine the meta-theatre of theatre – the processes we experience within the duration of a performance. The problem for me is that they have set a trend and now it seems anyone who is making a contemporary piece of theatre attempts to do something similar. I am sure that the tight financial constraints we are all under accounts for the high number of solo shows that are touring the circuits – I don’t have a problem with that at all. Some of these shows are excellent – for example Dan Bye’s ‘The Price of Everything’, Kieran Hurley’s ‘Beats’. But I am really getting bored of shows which start with the performer explaining to the audience that they are ‘the audience’ and that that the performer is not really ‘performing’. Yes by all means ‘steal’ from Tim Crouch or Chris Goode – but push the idea on, make it your own or do it for a real reason not just to follow the trend. When every show which claims to be pushing the form just adopts a form it isn’t pushing anything – except my buttons! Steal like an artist – don’t copy like a mynah bird.